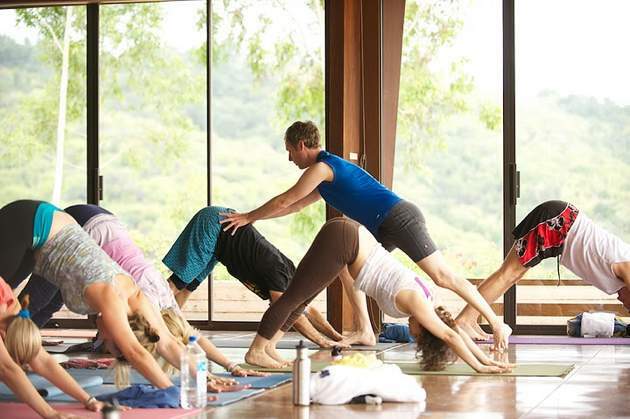 Jason Crandell was named one of the U.S.’ “next generation of yoga teachers” (Yoga Journal), for his skillful, unique approach to vinyasa yoga. Jason is the creator of 4 Yoga Journal dvd’s and author of Yoga Journal’s newest column entitled “Align and Refine.” He is a contributing editor for Yoga Journal and has authored over 50 articles, many of which have been translated in international editions. His primary influence is Rodney Yee. Find out more at www.jasonyoga.com. Favorite yoga style: I admit it, Iyengar Yoga—though, that’s not the style that I teach. Favorite yoga pose: Triangle because it contains a little bit of everything and its more sophisticated than it appears to be. Yoga is... I’m torn between giving an academic and personal answer. I’ll stick with personal. Yoga is a process of moving skillfully, breathing efficiently, listening carefully and observing oneself and others with greater clarity, objectivity and space. How adaptable the practice is to different people and circumstances. Yoga doesn’t change anyone’s personality. It shed’s light on our personality, and, in doing so, helps us make some behavioral modifications when necessary. It’s made my life more physically, mentally, and emotionally comfortable and given me tools to whether the occasional storms. Physically, it’s helped me feel much, much more integrated. What Everyday Thing Did You Get Better At Because Of Yoga? It’s helped me be nicer to people. I always do what I think my body needs and this has worked for 17 years. George W. Bush. He was a very misunderstood leader. No, honestly, that’s not true—it just came to mind and I thought it was funny. Seriously, comedians, satirists, and cultural critics inspire me right now. What Do You Listen To While You Do Yoga? Usually nothing. Sometimes, though, I’ll listen to the sweet sounds of Dave Flemming, John Miller, and Duane Kuiper calling a San Francisco Giants game. And, sometimes, my music collection which is almost exclusively comprised of punk rock. Teach from your heels, not your toes. Different people require different degrees of physicality to feel grounded and content. And, even more, people’s needs change. Be mindful of where you are on this spectrum and find a practice and teacher that works for you.